The Sony XIS series is one of the most intriguing and unknown surveillance systems available. 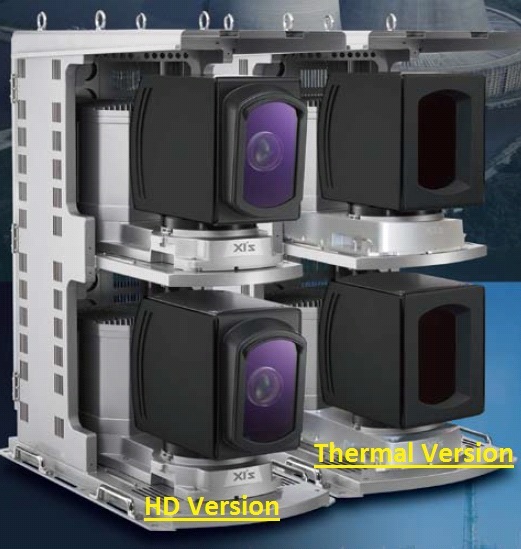 Designed to capture up to 186.6 Megapixels, this system is optimized for wide area monitoring of critical infrastructure locations. In this note, we examine the features, pricing and positioning of the system, comparing it to ipConfigure's gigapixel camera. Two generations of the system exist. Unfortunately, publicly available material is confusing. The current version is the XIS-3000 (see brochure/datasheet). This replaces the older version (the XIS-5400 (see brochure/datasheet). The Sony website still lists the older 5400 series. In this note, we focus on the current XIS-3000. The system creates a panomera by scanning and stiching together an overall image of the monitored area. For HD/color, the maximum image area is 188.6MPs. This is based on a 1920 x 1080 sensor output scanning across 120 panels (i.e., 1920 x 1080 x 120 = 248 MPs). For thermal, the imager is 640 x 480 and obviously is to be used in very dark areas or situations where heat needs to be detected. Each system has two cameras - one that creates the panomera and a second that can be used to zoom into objects in real time to track potential threats. "The bottom row (with objects closer to the camera) could be made from fewer panels than the middle and top rows where objects are farther away." "XIS has a variety of image enhancement features for heat wave shimmer control, image stabilization, visibility in heavy fog, sun flicker off the ocean, wave action, etc." "The software running the panomera camera can detect changes in the scene (live or playback) and drive the spot cameras to any area in the field of view." "The recorded daytime images from the visible camera can be used with the live feed from the thermal camera to reference and overlay landmarks and horizon lines." "XIS is integrated to Vidsys giving the system integration to ground based radar and a variety of other systems which can also drive any of the spot cameras." Sony says this is a design-build solution (i.e., custom, not COTS) and that depending on the configuration the pricing is often in the $500,000 USD to $1 Million+ USD range. Obviously to deeply compare, one would have to test both in real world environments - which we have note done. That said, some structural differences do exist. With the lower resolution CCD imagers and the image enhancement features, lower light and WDR performance may be better. Integration with Vidsys may indicate or help in using with 3rd parties. 400% greater resolution: ipConfigure uses a 16MP camera rather than a 1.5MP one. Of course, how much of a benefit the higher resolution camera makes, we do not know. Lower price: The pricing is much lower, starting at less than $100,000 USD. This category of scanning super high resolution systems looks to have real potential for large area, critical infrastructure applications.